A.T. 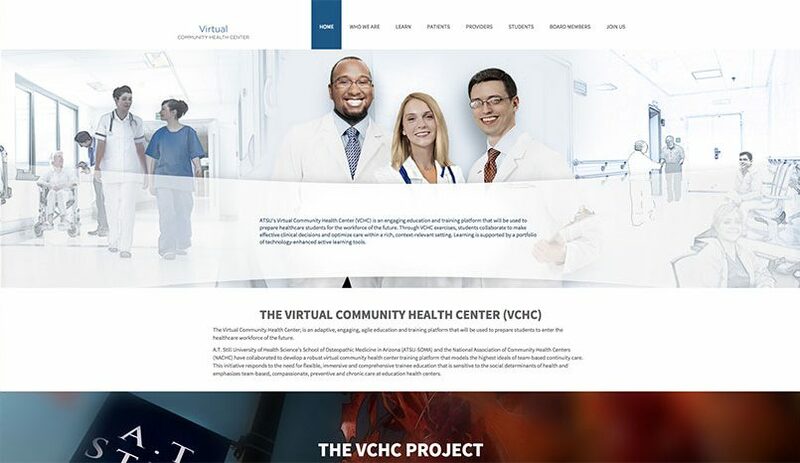 Still University’s School of Osteopathic Medicine (ATSU-SOMA) has chosen a name for the Virtual Community Health Center (VCHC). The VCHC, now the A.T. Still University Envision Community Health Center, will be an important component of the education of students in interprofessional teamwork and medical decision-making. Student experiences in the Envision CHC will prepare them to provide care in ATSU-SOMA’s “real-world” community campuses. Envision CHC’s virtual population will present realistic, socially-complex life and medical problems for student teams to work on with virtual patients and families. The ATSU Envision CHC will first appear as a website linked to atsu.edu with the look and feel of a bona fide community health center website. Virtual clinical cases will reflect Envision CHC’s diverse patient panel, consisting of 10 patient families, connected by Centricity electronic health record system provided by a generous grant from General Electric. Virtual patient encounters will provide practice with clinical reasoning and social determinants during OMS I-IV and residency. Initially, 50 cases (OMS I-II) will be used to prepare students for success in the technology-enhanced, patient-centered, data-rich healthcare environment of the future. Other advanced technology learning opportunities planned are uniform data sets, decision support tools, and virtual anatomy. The VCHC team is seeking collaborative partners. Key ATSU-SOMA faculty members of the Envision CHC team include Associate Dean Frederic Schwartz, DO, Tom Bennett, DO, director of the VCHC project, Monica Fernandez, MMS, PA-C, education specialist, Lise McCoy, EdD (ABD) assistant director, faculty development, Noel Carrasco, MD, and Stan Brysacz, DO. The project team has received letters of interest from many ATSU schools and educational organizations outside ATSU-SOMA. Please join the VCHC collaborative. Become part of the project and process by sending a message to vchcproject@atsu.edu.